The usual route, after leaving the valley floor, is to climb towards the icefall and then travel beside it on the west until Crow névé is reached. The two obvious gullies to the true right of the icefall are the best options, but beware of avalanches after fresh snowfall. In summer, large pinnacles of ice crash down the bluffs on the true left. Beware of hidden crevasses. From the Crow névé, all three peaks of Mt Rolleston are accessible. 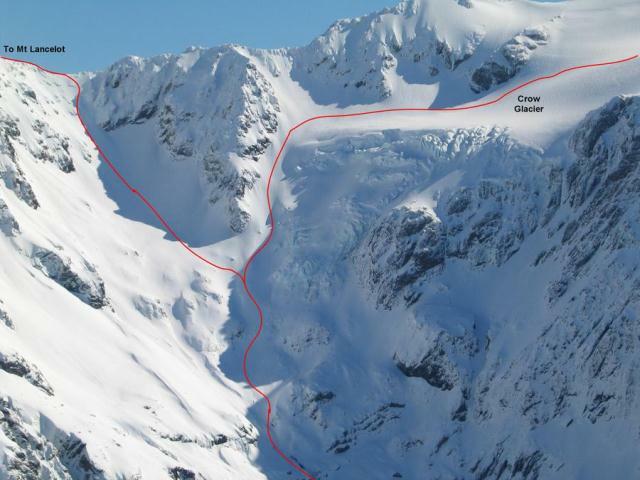 The summit ridge may be cut off by deep crevasses late in the season. The low peak is reached easily from the northeastern reaches of the névé (the crux on this climb is the glacial ascent from the Crow valley). Ascended from the Crow neve by a myriad of rock gullies or aretes joining the West Ridge of High Peak. Most of these routes tend to be single pitch climbs dependant on snow ramp heights, and the presence of bergschrunds. Protection is sparse in summer conditions, however the rock grades are very low. A rock (summer) or ice (winter) route exists on the Southern Face directly below the summit of High Peak (2275m). Access is difficult due to the very large bergschrund at the base of the face. Ascent is made up a shallow diagonal gully directly to the peak. Protection is minimal in summer. Ascended easily using the Eastern Ridge from the col adjacent Middle Peak. 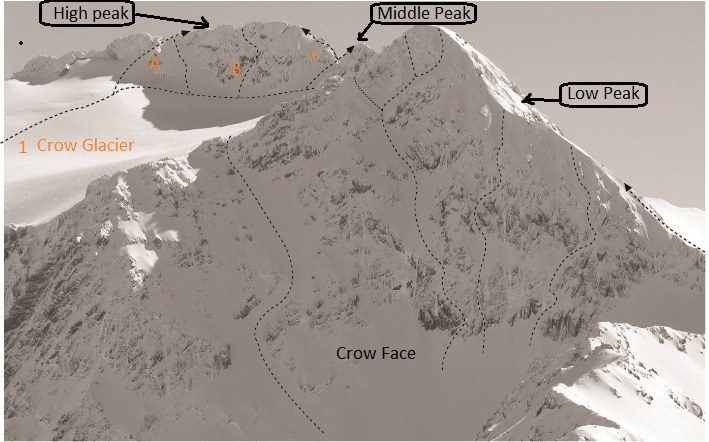 Approach the col from directly below on the Crow neve to avoid at least some major crevasse zones. The first buttress on this ridge is turned on it’s southern flank. climbed from the head of the valley near Waimakariri Col. Snow slopes lead up towards the neve of a glacier running north of MT ROLLESTON. Climb the obvious gully joining the Philistine Ridge, then 70m above the neve take the narrow, steep couloir (Sampson's) on the true left. This joins the Southwest Ridge after a climb of 120m. Traverse the short distance to High Peak. The peak may also be approached more directly by the broken rock buttresses of the Philistine Ridge. Climbed by traversing the ridge from Mt Philistine (1967m), a very long climb generally on loose rock, with many obstacles. Most gendarmes can be turned on narrow ledges (catwalks). Beware of cornices in winter to late spring. Be prepared for a forced bivy should your start route to either summit be a face climb. Some ropework may be required.